GFS Chemicals, Inc. @ ChemBuyersGuide.com, Inc.
GFS manufactures over 4,000 analytical reagents, research organics and inorganic chemicals, and specialty chemicals. Founded upon the production of high purity, ultra dry inorganic salts, GFS manufactures perchlorate compounds, lithium salts, cerous chloride, cadmium chloride, ceric ammonium nitrate and high purity acids in bulk quantities among many other products. The organic product line is built upon the Farchan line of acetylenic and olefinic research intermediates. Supporting lines include a broad spectrum of new and existing products for chromatography and materials purification and separation. 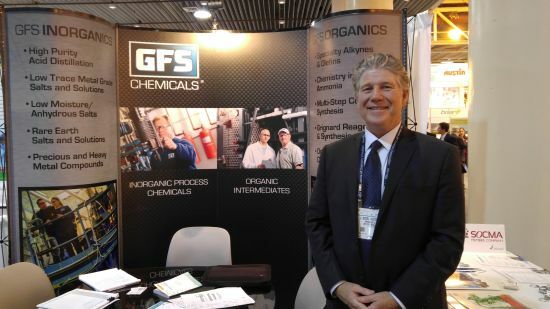 GFS Chemicals has committed 14,000 square feet of production operations to specialty organics, has expanded inorganic and anhydrous salt production, now provides up to 10-times greater reactor scale, and has enhanced both QC and R&D capabilities for both small quantity and bulk order customers. GFS Chemicals, in its' 80th year of growth, sells fine and specialty chemicals. Based in Columbus, Ohio, the company maintains ISO 9001:2000 Certification. Not on the TSCA inventory. Requires rigeration. Not on the TSCA inventory. Tripyridine, Tripyridyl. Reagent for colorimetry. Not on the TSCA inventory, for R&D use only. Intended for Hach Surface Scatter 6 instrument. Not on the TSCA inventory. Cetylamine fluoride. Isopentanol. Iron and copper free. Made per Reagent Chemicals, 10th ed., p 104. For volumetric titrations. Titer approx. 5 mg/ml. For standardization of volumetric titrants. Assay (by GC-FID) 98.0% min. Assay (by GC) 98.5% min. Paricle size -100 mesh 98% min. Assay (anhydrous basis) 98% min. Melting point 210 C min. Assay (as Cr) 19% min. Assay (metals basis) 99.7% min. Assay (metals basis) 99.5% min. Assay (anhydrous basis) 91.0% min. Basic lead (PbO) 33.0% min. Assay (metals basis) 99.9% min. Assay (as LiSCN) 65% min. Assay (after drying) 98.0% min. Melting point 258 C min. Assay (as LiIO3) 91% min. Assay (by GC) 98% min. Assay (by GC) 99.0% min.